This page describes how to deploy your project to the App Engine flexible environment Jetty runtime. 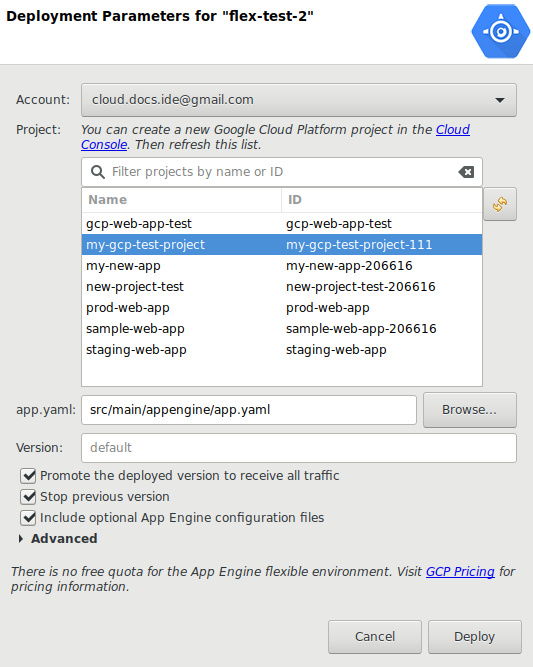 Sign in to a Google account that is used to deploy your project to App Engine. Select File > Sign in to Google. If you see Manage Google Accounts instead of the Sign in to Google option, that means you are already signed in, so you can skip these account sign in steps. Click Allow and close the window. 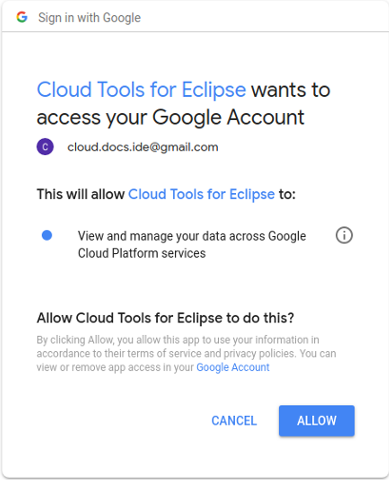 Eclipse is now signed into your account. In the Project Explorer, right click the project you want to deploy. Open the context menu, and select Properties. In the sidebar, select Project Facets. If your project is not faceted, click the Convert to faceted form... link to display the available facets. 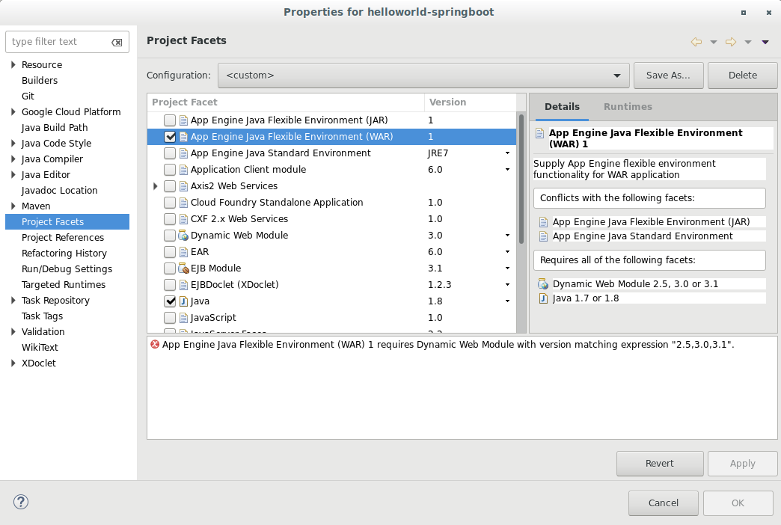 Select the App Engine Java Flexible Environment (WAR) facet checkbox. In the Package Explorer or Project Explorer, select the project you want to deploy. Click the Google Cloud Platform toolbar button . Select Deploy to App Engine Flexible in the drop-down menu. Select the Account you want to deploy with, or add a new account. In the Project field, select the Google Cloud Platform project you want to deploy to. In the app.yaml field, click Browse to select your app.yaml file if it is not in the default src/main/appengine/ directory. If you want to keep the current version running and manually promote the new version later using gcloud or the Google Cloud Platform Console, clear the Promote the deployed version to receive all traffic checkbox. If you don't want to stop the previous version, clear the Stop previous version checkbox. A background job launches to deploy the project to App Engine. The output of the job is visible in the Eclipse Console view. Explore the plugin code or report issues on GitHub, or ask a question on Stack Overflow.